For the film featuring Charlie Chaplin's character of the same name, see The Tramp (film). For the song, see The Tramp (song). The Tramp (Charlot in several languages), also known as The Little Tramp, was British actor Charlie Chaplin's most memorable on-screen character and an icon in world cinema during the era of silent film. The Tramp is also the title of a silent film starring Chaplin, which Chaplin wrote and directed in 1915. Charlie Chaplin as "the Tramp". The Tramp, as portrayed by Chaplin, is a childlike, bumbling but generally good-hearted character who is most famously portrayed as a vagrant who endeavors to behave with the manners and dignity of a gentleman despite his actual social status. However, while he is ready to take what paying work is available, he also uses his cunning to get what he needs to survive and escape the authority figures who will not tolerate his antics. Chaplin's films did not always portray the Tramp as a vagrant, however. 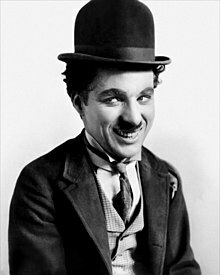 The character ("The little fellow," as Chaplin called him) was rarely referred to by any names on-screen, although he was sometimes identified as "Charlie" and rarely, as in the original silent version of The Gold Rush, "The little funny tramp". Kid Auto Races at Venice was the first appearance of the Tramp released but actually the second film shot. A hotel set was built for (fellow Keystone comic) Mabel Normand's picture Mabel's Strange Predicament and I was hurriedly told to put on a funny make-up. This time I went to the wardrobe and got a pair of baggy pants, a tight coat, a small derby hat and a large pair of shoes. I wanted the clothes to be a mass of contradictions, knowing pictorially the figure would be vividly outlined on the screen. To add a comic touch, I wore a small mustache which would not hide my expression. My appearance got an enthusiastic response from everyone, including Mr. Sennett. The clothes seemed to imbue me with the spirit of the character. He actually became a man with a soul—a point of view. I defined to Mr. Sennett the type of person he was. He wears an air of romantic hunger, forever seeking romance, but his feet won't let him. That was actually the first film featuring the Tramp but a different film, shot later but with the same character, happened to be released two days earlier. 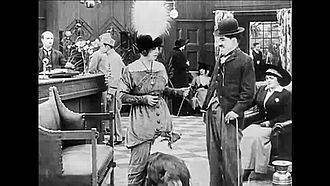 The Tramp debuted to the public in the Keystone comedy Kid Auto Races at Venice (released on February 7, 1914; Mabel's Strange Predicament, shot earlier, was released on February 9, 1914). Chaplin, with his Little Tramp character, quickly became the most popular star in Keystone director Mack Sennett's company of players. Chaplin continued to play the Tramp through dozens of short films and, later, feature-length productions. (In only a handful of other productions did he play characters other than the Tramp). The Tramp was closely identified with the silent era, and was considered an international character. When the sound era began in the late 1920s, Chaplin refused to make a talkie featuring the character, partly due to how the character was supposed to be American, and Chaplin himself had a strong and obvious British accent. The 1931 production City Lights featured no dialogue. Chaplin officially retired the character in the film Modern Times (released February 5, 1936), which appropriately ended with the Tramp walking down an endless highway toward the horizon. The film was only a partial talkie and is often called the last silent film. The Tramp remains silent until near the end of the film when, for the first time, his voice is finally heard, albeit only as part of a French/Italian-derived gibberish song. This allowed the Tramp to finally be given a voice but not tarnish his association with the silent era. In The Great Dictator, Chaplin's first film after Modern Times, Chaplin plays the dual role of a Hitler-esque dictator, and a Jewish barber. Although Chaplin emphatically stated that the barber was not the Tramp, he retains the Tramp's moustache, hat, and general appearance. Despite a few silent scenes, including one where the barber is wearing the Tramp's coat and bowler hat and carrying his cane, the barber speaks throughout the film (using Chaplin's own British accent), including the passionate plea for peace that has been widely interpreted as Chaplin speaking as himself. In 1959, having been editing The Chaplin Revue, Chaplin commented to a reporter (regarding the Tramp character) "I was wrong to kill him. There was room for the Little Man in the atomic age." A vaudeville performer named Lew Bloom created a similar tramp character which inspired Chaplin. According to Bloom, he was "the first stage tramp in the business". In an interview with the Daily Herald in 1957 Chaplin recalled being inspired by the tramp characters Weary Willie and Tired Tim from Illustrated Chips. The Tramp on the road. The physical attributes of the Tramp include a pair of baggy pants, a tight coat, a small bowler hat, a large pair of shoes, a springy and flexible cane and the famous small mustache. The Tramp walks strangely and uncomfortably because of the ill-fitting clothing; either he is wearing secondhand clothes, or they are originally his but he cannot afford new ones. The Tramp may have seen better days, but he maintains the attitude and demeanor of a high-class individual; as long as he acts like one he can believe that he is one, and is able to keep his hope that some day he actually will be again. Two films made in 1915, The Tramp and The Bank, created the characteristics of Chaplin's screen persona. While in the end the Tramp manages to shake off his disappointment and resume his carefree ways, the pathos lies in the Tramp's having a hope for a more permanent transformation through love, and his failure to achieve this. The Tramp was usually the victim of circumstance and coincidence, but sometimes the results worked in his favor. In Modern Times, he picks up a red flag that falls off a truck and starts to wave it at the truck in an attempt to return it, and by doing so, unknowingly and inadvertently becomes the leader of a group of protesting workers, and ends up in jail because of it. While in jail he accidentally eats “nose powder” (i.e., cocaine), which causes him to not return to his jail cell; but when he eventually does, he fights off some jailbreakers attempting to escape, thus saving the life of the warden. Because of this, the warden offers to let him go, but the Tramp would rather stay in jail because it is better than the outside world. Chaplin's social commentary, while critical of the faults and excesses created by industrialization, also shows support for and belief in the “American Dream." In Modern Times, Chaplin creates a “portrayal consistent with popular leftist stereotypes of wealthy union leaders and oppressed workers in the 1930s.” While the Tramp and his fellow workers sweat on the assembly line, the president of the Electro Steel Company works on a puzzle and reads the funnies in the newspaper. The obsession of working with efficiency and assembly-line productivity ultimately drives the Tramp mad. This could be seen as “an attack on the capitalist rationalization of production.” However, “the film also guardedly affirms American middle-class, particularly its optimism.” For example, one sequence depicts the Tramp's dream in which he and the gamine live a traditional middle-class lifestyle. Chaplin used not one but two similar-looking characters to the Tramp in The Great Dictator (released October 15, 1940); however, this was an all-talking film (Chaplin's first). The film was inspired by the noted similarity between Chaplin's Tramp (most notably his small mustache) and that of German dictator Adolf Hitler. Chaplin used this similarity to create a dark version of the Tramp character in parody of the dictator. (In his book My Autobiography, Chaplin stated that he was unaware of the Holocaust when he made the film; if he had been, he writes, he wouldn't have been able to make a comedy satirizing Hitler). In his autobiography, Chaplin identifies the barber as the Tramp. A noticeable difference is that the barber has a streak of grey in his hair, whereas the Tramp had always been depicted as having dark hair. Also, the barber lacks the ill-fitting clothes of the Tramp, and is clearly portrayed as having a profession. His character does share much of The Tramp's character, notably his idealism and anger on seeing unfairness. The Tramp is also a short film starring Chaplin as the titular main character. In the film, a hobo exchanges the Tramp's sandwich for a brick, so the Tramp must eat grass. The same hobo later bothers a farmer's daughter, and the Tramp comes to her aid with the help of the brick. When two more hobos show up, the Tramp throws all three into a lake. The grateful girl takes the Tramp home, where he fails as a farmhand. He again helps drive off the hobos (who are now trying to break into the house). The girl's fiancé arrives. Though a hero, Charlie—knowing he must go—writes a farewell note and leaves again for the open road. The film also stars Edna Purviance, Lloyd Bacon, and Leo White. The Tramp was released on April 11, 1915, through Essanay Studios. Numerous works cite the Tramp as an icon of the Great Depression, of Charlie Chaplin himself, and of the downtrodden hero, from Chaplin's own movies with similar characters (such as The Great Dictator), to the dapper, silent penguin rescued by Bugs Bunny. In the 1980s, the character was portrayed in advertising for the IBM PC personal computer. The cartoon character "Baggy Pants" presents an imitation of the Tramp. From 1973 to 1990, the children's educational television series Sesame Street occasionally featured cast member Sonia Manzano, who played Maria, in character as the Tramp for some skits, often accompanied by fellow cast member Linda Bove either as a second Tramp or a supporting character, namely a pretty lady. Indian filmmaker-actor Raj Kapoor was inspired by Chaplin's "tramp" character, adopting a similar "tramp" persona in a number of his films, such as Awaara (1951) and Shree 420 (1954). ^ Hale, Benjamin. "Echoes Across Cinema: The Charlie Chaplin Story". History Cooperitave. Retrieved 19 December 2018. ^ Truffaut, François. The films in my life (1st Da Capo Press ed.). Da Capo Press. ISBN 978-0-306-80599-8. ^ Gravett, Paul (2014). Comics Unmasked: Art and Anarchy in the UK. British Library. p. 50. ISBN 978-0-7123-5735-7. ^ Frayling, Christopher (19 October 2012). "Charlie Chaplin: how he turned into the Tramp". Retrieved 16 December 2018. ^ Maland 1991, p. 151. ^ Maland 1991, p. 152. ^ Maland 1991, p. 153. ^ Maland 1991, p. 150. ^ Maland 1991, p. 110. ^ Maland 1991, p. 113. ^ Maasik, Sonia; Solomon, Jack (1994). Caputi, Jane (ed.). IBM's Charlie Chaplin: A Case Study. Signs of Life in the U.S.A.: Readings on Popular Culture for Writers. Boston: Bedford Books. pp. 117–121. Archived from the original on 23 February 2019 – via University of Virginia. ^ Papson, Stephen (April 1990). "The IBM tramp". Jump Cut (35): 66–72. ^ Mazumder, Ranjib (December 11, 2015). "Before Brando, There Was Dilip Kumar". The Quint. Retrieved 23 February 2019. Wikimedia Commons has media related to The Tramp (character).